When people think about blog design, they usually think of colors, fonts, and images first. But design also includes navigation design, which is design centered around how visitors move through your blog. Your navigation design should always be focused around helping blog visitors find their way around your site in the simplest, most logical way possible. However, navigation design can also mean offering your readers little (or big) surprises that go above and beyond the basics. For example, the blog From Away focuses on cooking and eating in Maine, with a page called Our Favorite Places in Portland that covers Portland’s best breakfast sandwiches, pizzas, lobster rolls, and more. 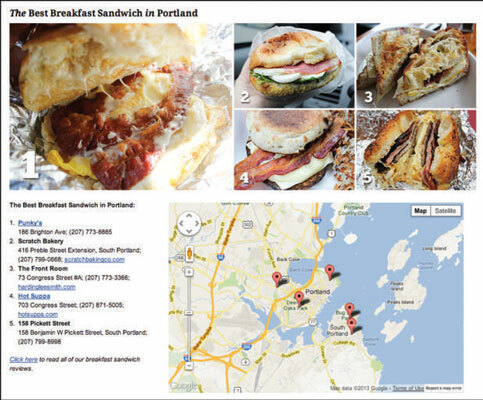 You can see the breakfast sandwich section, where a visitor can navigate to each restaurant’s website, see a map of those restaurants, and click a link to go to reviews of those sandwiches. Plus, each sandwich is clearly numbered and represented by a close-up image. The result is a useful tool that readers will return to when they want to eat in Portland. An image toward the bottom of their homepage calls attention to the page, and it’s also linked from their main navigation menu. After you get the basics out of the way on your own blog’s navigation design, consider ways you can add bonuses like this to get readers deeper into your content or other useful content elsewhere.